We inform you that the data you provide to the owner of this site at the time of compiling the "contact form" (also known as email form) of this site, will be treated in compliance with the provisions of Legislative Decree no. 196/2003, regarding personal data protection. The contacts forms made available on the site have the sole purpose of allowing site visitors to contact, if they so wish, the operator of the site, through this form by sending an email to the manager. This statement concerns personal data sent by visitors when completing the contacts forms. We inform you that the data you provide us through the form will be turned into an email that will eventually be kept within the e-mail receiver system used by the site owner. These data are not recorded on other media or devices, nor will other data deriving from its site navigation. The data you send will be used for the sole purpose of being able to eventually get back in touch with the references to her left through the contact form to fulfill any of its requests contained in the message she sent. The only personal data collected will be the ones you provided when completing the contact form. The processing of personal data is carried out by means of the operations or the transactions listed in Art. 4 paragraph 1 letter. a) Legislative Decree no. 196/2003. The treatment is carried out directly by the owner. Providing data is optional. However, the refusal to grant access will make it impossible to be contacted by Vianello Limousine Service. The data controller is Vianello Limousine Service, VAT IT04218880260. The subjects to whom the personal data refer have the right at any time to obtain confirmation of the existence or not of the same data and to know its content and origin, verify its accuracy or request the update, integration or correction (art. 7 Legislative Decree no. 196/03). 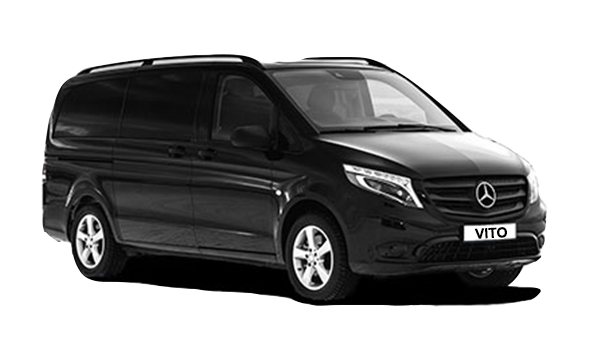 Similar to the V Class the Mercedes Vito is the answer form Mercedes-Benz to the need of the ground transpostation industry to transport up to 8 passengers. The new Mercedes Vito combines functionality with attractiveness in an exemplary manner. Powerful and agile – a combination with which the new Vito maximises driving dynamics and comfort. It combines the spaciousness of its interior with unrivalled agility on the road. Vianello Limousine Service is a member of the NLA organization dedicated to representing the worldwide luxury chauffeured ground transportation industry.